On this blog, I have been tracking the number of Twitter users reported by Twitdir. On April 28, I announced that Twitter passed the 1 million mark. 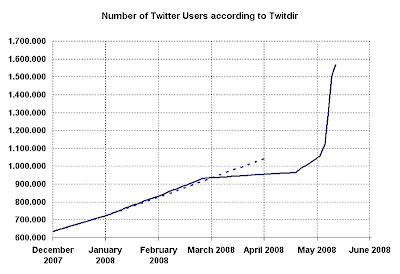 According to Twitdir, Twitter has currently over 1.5 million users. Over a period of a little bit more than two weeks Twitdir was capable of detecting 0.5 million users. This sudden increase in the number reported by Twitdir is probably due to a change in its algorithm, as announced on the Twitdir blog. Who wants to make a guess when Twitter will reach the 2 million mark ? Do you have an educated guess on the amount of Belgian or Dutch language audience on Twitter? These figures refer to Twitter accounts explicitely mentioning a location in their Twitter profiles. What a growth. Talking about educated estimates, any idea on the amount of italians and italian language audience on twitter. Where do you look fort this kind of statistics?